No, not for me! We’re definitely happy with our three-kid family. But I have a lot of pregnant friends however, and my own kids are young enough that I well remember trying to combine being pregnant and frugal myself. So how can you be pregnant and frugal? Well the first thing I would suggest is to stay away from lists of things that you absolutely must do or have, just like before you got pregnant. Prenatal yoga, or whatever the trend of the day is might be the latest ‘must thing’, but it might not be what’s best for you. Or perhaps I just loved my pregnancy body pillow (which I did)- that doesn’t mean that you should run out and buy one. Try to borrow one of whatever it is you want from a friend, or improvise a solution. Could you perhaps rent some DVDs or borrow them from the library to see if yoga is your thing? Maybe use a king-size pillow instead of a pregnancy pillow. And although you might think that you already know or not if you’re going to like something, I have to add my two cents here: just because you liked it before getting pregnant, doesn’t mean that it’s going to be your thing while you’re pregnant. On the other hand, if you’re the sort of person who has always wanted a large family, and you know exactly what it is you want, then don’t be afraid to buy the very best quality whatever-it-is while you’re pregnant with your first– chances are you’ll get your money’s worth out of it! I bought a really good quality pregnancy/nursing pillow while I was pregnant with my first, and used it for all three pregnancies (and babies). Another suggestion is to educate yourself on the risks you’re willing to take, versus the rewards you could potentially reap. For example, pregnant women in the United States are routinely prescribed prenatal vitamins- in some cases before they even get pregnant. In France, however, women never take prenatal vitamins, and as far as I’m aware, there is not a higher rate of birth defects. I am not a medical professional and only you can talk to your health care provider and decide the risks and benefits of what you are willing to do, but it’s an example of how thinking outside the box might be a good frugal decision for you. Coming back to a less controversial topic, I would say that you probably don’t need to buy that many maternity clothes, depending on your professional status. I bought very few maternity clothes, mostly pants. I was able to get away with large t-shirts and stretch pants, which also serve afterwards as what Jonniker calls transitional pants. Then again I didn’t have to dress very nicely for work, so I was able to get away with it! Pregnancy is an exciting time in your life, but it doesn’t have to be an expensive time. Here are some more frugal resources for young babies and children. WiseBread has a forum discussion on frugal pregnancy tips. When the baby arrives, here are some of my ideas for frugal gifts for new parents and new babies. Emma from Baby-Log wrote a guest post on frugal child-proofing. Here’s a post on frugal baby food. I wrote about the ethics and economics of used baby clothes. What are your frugal pregnancy tips? 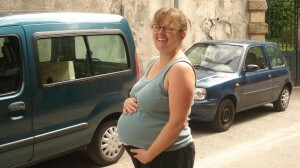 Frugal pregnancy – what a great topic! My own comment (having had two kids) is that you should avoid, if you want to be frugal, the mindset that pregnancy = “extra” spending in order to “pamper” yourself or recognize the “special” situation you are in. Yes, pregnancy is a special time and pregnant women deserve to be honoured and pampered. It just doesn’t have to take any money to do it! My doctor let me buy over-the-counter prenatal vitamins from Wal-Mart. She was going to prescribe some for me, but all I had to do was ask about the over-the-counter ones and she said they were fine to use. It saved me quite a bit of money because they were a lot less expensive than the prescription ones. I second getting high quality stuff you know you’ll use — especially if you plan on more than one kid. It’s not specifically a pregnancy expense, but I wish I had spent the money on brand new cloth diapers. I got most of mine used and while that was fine for the more sturdy prefolds, my fitted diapers are at the end of their rope and will never make it through a second baby. I’ll have to buy more and I won’t end up saving in the long run. The 2 most important things in prenatal vitamins are iron (because your blood volume has to expand a lot during the pregnancy) and folic acid, which helps prevent serious neural tube defects (like spina bifida). I also haven’t done any research on the incidence of anemia or spina bifida in France vs. the US or anywhere else but if there is less of a problem in France despite them not taking prenatal vitamins there could easily be another reason, such as a difference in diet. There’s certainly been a lot written about the deficiencies of the typical North American diet and how much better Europeans eat. It wouldn’t be very frugal to skimp on the vitamins (especially as I believe the folic acid issue is really only critical during the first trimester and immediately prior to conception) and then have to deal with a child who had an exposed spinal cord and might never walk. Surgery, specialists, OT, wheelchairs or other mobility devices would be a lot more expensive than vitamins, never mind the emotional aspects. Sorry, I used to live in the same building as someone whose daughter had spina bifida and she went through a lot. I saved money by not buying things like baby swings, by using cloth diapers part of the time (not pricey prefolds, just real flannelette diapers), by breastfeeding and not introducing solid foods before 6 months. And by using as few canned baby foods as possible. It’s very easy to just mush up stuff you’re eating for baby. I liked this post, Kelly – and thanks for the link too! Same here, all I bought for pregnancy was 2 pairs of pants and a couple of large jumpers. I bought some breastfeeding clothes over the Internet because they were cheaper, the prices in shops for the same were impossible. Over-the-counter prenatals work for a lot of women. Unless your doctor says otherwise, why pay more for the prescription? I’ve never had kids, so I can’t speak to a lot of the “special” items women buy, but I do take prenatal vitamins because they actually have all the vitamins a non-pregnant woman needs anyway. So, it’s already a part of my budget. Of course, always seek the advice of a healthcare professional before taking them. A lot of folks around the blogosphere seem to be having babies and talking about the associated costs. What’s always struck me when reading the posts is that a lot of them do spend quite a bit. I don’t know if it’s just that baby costs have seriously escalated over the years or if some of them are choosing not to be as frugal in this area of their finances. Interesting topic, Kelly! I’d very much like to know from the other parents out there, is there such as thing as being too frugal in this area? I’m sure there is, but not being a parent, I don’t know. Great tips (reminders)! I’m going to bookmark this for future reference. All I have to say is "yard sale"!! I got all my maternity stuff at various yard sales (or given to me by others), and bought all my children's clothes there, and everything else I needed that I didn't have given to me. Also cloth diapers. I never bought one thing of baby food of any sort (figuring that babies survived plenty long before Gerber was on the scene, so our grandmothers and beyond must have been able to manage without it). I was given a few jars of baby food, so tried them on my older son, and he refused to eat more than a bite or two. There are *lots* of ways to be frugal.